Yes we need high speed trains and more infrastructure to make rail and road travel more accessible to the masses, more efficient and comfortable. NEW DELHI: China and Japan are once again in competition, this time for the lucrative high speed rail network market in India. The Japanese are already working on a feasibility study for the Shinkansen network on the Ahmedabad-Mumbai corridor, the results of which will be shared with the Indian side in the run-up to the PM's visit to Japan this weekend. Japanese Prime Minister Shinzo Abe is expected to make a strong pitch for India to buy the Shinkansen high speed network. Kyoto, where Modi lands on Saturday, has the best known Shinkansen connection with Tokyo. Meanwhile, China, which now has the longest high-speed rail network in the world, is keen to sell their trains to India, at a price much lower than the Japanese. The Chinese president, Xi Jinping, will arrive for his maiden visit to India in mid-September. Japan is hardselling better quality and higher safety standards, while China is pitching lower costs. According to officials familiar with developments, Japan, at present enjoys a slight edge largely due to its safety record. China has had at least one spectacular high speed rail accident, killing hundreds. However, the Shinkansen's cost is prohibitively high, and despite having a fail-proof safety and speed system for almost half a century, Japan has not had great success in selling it overseas. However, a new Japanese entity, International High-Speed Rail Association, comprising all the companies that build high speed railways in Japan will try to convince India about its product in October, said officials. Given the projected cost for each train at around Rs 60,000 crore (as announced by railway minister Sadananda Gowda in his railway budget speech) officials said Japan can sweeten the offer with a better financial deal, including FDI. China has been sounded out on upgrading India's ageing and inefficient railways infrastructure, even building new stations. But the prize is the bullet trains because they are outright buys. China, which plans to have 19,000 km under high speed rail network from its present 11,000 by 2015, is now looking for private investment into the railway sector. Thus far, it has been funded solely by the government. But Chinese premier Li Keqiang announced on Sunday that henceforth China's railway growth, which he sees as essential for China's development would have to come from private sources. India is planning to build high speed train networks on other routes such as Delhi-Agra, Delhi-Chandigarh, Mysore-Bangalore-Chennai, Mumbai-Goa and Hyderabad-Secunderabad. Please make a condition that China cannot bid at any rate. It is sign to show them that India is not interested in any business who are not good neighbour. The former Delhi chief minister and Aam Aadmi Party (AAP) founder Arvind Kejriwal on Sunday came up with a bizarre calculation about bullet train fares. In a video 44 second video clipping, he is shown as speaking that the Ahmedabad to Mumbai one way ticket fare on bullet train will be Rs 75,000 per person. 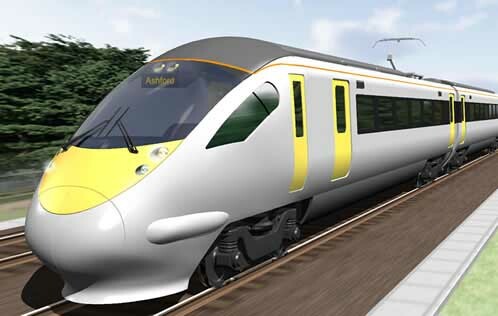 On July 8, Railway Minister D V Sadananda Gowda had said that the first dedicated bullet train project will be launched on the Mumbai-Ahmedabad high-speed rail corridor route for which many feasibility studies have been conducted. Not before taking care of things like this. JAIPUR: A camel in the interiors of Rajasthan took its recently acquired status of 'state animal' a bit too seriously, blocking the trunk rail route between Delhi and Mumbai for around three hours. Taking an extraordinary fondness for walking on the tracks, or perhaps merely in one of its obdurate moods, the two-metre tall gentle giant gave much grief to passengers near Hindaun City in Karauli district, holding up at least eight trains that either halted or crawled between Mahaveerji and Hindaun City section - a distance of around 14 km. Railway sources said the camel planted itself on the tracks at 8.45pm on Saturday when a goods train was on its way from Delhi to Mumbai halting it. When it finally did relent, the goods train left; however, the even-toed ungulate was back on tracks, this time blocking the Amritsar-Mumbai Express. "The train crew did everything, from blaring the horn from close quarters to trying to physically push it aside," said Prabhu Singh, a train crew. By this time panic was beginning to set in. Station masters of Mahaveerji and Hindaun asked train drivers on the route to slow down and not to exceed five km per hour. All this while, the temperamental beast would deign to get up from one track, only to settle on the second track, causing a virtual mayhem with the transportation system. "While the camel was on and off the tracks between Mahaveerji and Hindaun City, the trains were moving at a very slow pace as the drivers were asked to reduce speed to avoid a mishap," said an officer. "For three hours or so, it walked the up section Delhi to Mumbai, and then went to Down section Mumbai to Delhi, halting at least eight trains in that period," said an incredulous railwayman. Looks like Chinese are now paying TOIlet. The Chinese had their high own speed network built by Germans. Unless they managed to reverse Engineer it in 10 years, they would not be in the reckoning at all. The players in the high speed trains are Germany, Japan and France.